You don't need doom riffs and Irish blood running through your veins to enjoy a shot of Astralnaut. With the release of Thieves, Beggars & Swine, this 5-piece hailing from Northern Ireland will have you nodding your head to their epic riffs. The band wastes no time, blowing it open with "Ego Eccentric." The tune boasts a righteous riff along with a groovy breakdown/solo section. The slow doom and bluesy solo of "Mac Tire" has a confident swagger to it. On "Neopium," vocalist Thomas Mallon channels the spirit of Jim Morrison, giving us an idea of what the sixties icon would have sounded like fronting a stoner rock band. "Utopian Dawn" rises with a mellow intro before the drums crash through and "Dethroned" walks through a series of tempo changes in what could be called classic, epic doom. The guitar duo of Gaz Treanor (lead) and Pearse Donnelly (rhythm) provide a heavy, sonic landscape while Stephen Todd (drums) and JonJoe Harrison (bass guitar) keep the bottom end nailed down with chunky, driving, low end. Thomas Mallon's vocals are unique and yet his influences are recognizable. With equal parts Zakk Wylde, Neil Fallon and Kory Clarke, Mallon has growl while staying melodic. The attention to vocal arrangements and production is what sets Astralnaut apart from the hordes of stoner rock bands out there today. Harrison and Donnelly's backing tracks help to fill out the vocal spectrum. Clark Phillips did a masterful job with the production of the record and the original tracking at Hi-Tone Studios must have been superb for the final mixes to sound so stunning. Thieves, Beggars and Swine by Astralnaut I'll admit that I'm a bit biased because my great grandparents were born on the Emerald Isle. 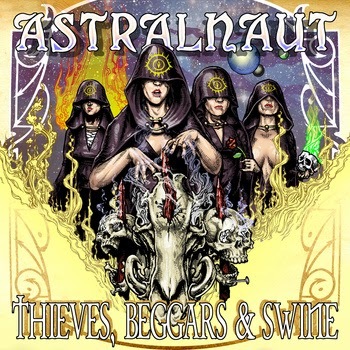 But even if you have no connection to Ireland, you'll appreciate Astralnaut as purveyors of epic, slugging, doom. Thieves, Beggars & Swine is at the top of my list for best releases of 2014.